These are my twin boys, Brody & Mason. My family has forever loved the movie Dumb and Dumber and can quote most of it. We were trying to come up with an idea for a twin costume that wasn't overplayed and knew we had to do this. I had just bought a sewing machine and a friend showed me how to use it a couple months earlier but since these costumes don't exist to buy (not that we could find) I made them without a pattern as one of my first ever sewing projects including the top hats. It was a serious undertaking but so worth the reaction we got trick or treating. Is this available to order?? This is amazing! 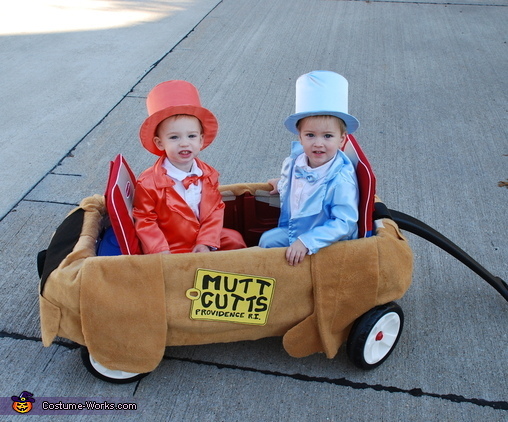 Would you be interested in making another Mutt Cutts thing for the wagon?? Let me know how much! This is the best! I have loved this idea since before I had children and lucky me I have twin boys!! They will be 22 months this Halloween and I'd love to do this! Do you make costumes and sell them?? I need to make my Wagon look like this ! Do you still make them ?? ?